This really does make an attractive garden feature and is sure to get you many compliments from friends as well as a few jealous looks from the neighbours. This is so comfortable that you will want to sit, relax and swing on it for hours on end. It is constructed out of natural timber and is one very solid and well made structure. It has lattice sides, perfect for growing trailing plants and a sloping pointed roof that just oozes charm and style. The swing seat gives a gentle sway and it’s a great place to sit and reflect, while admiring the view. This product is home delivered. 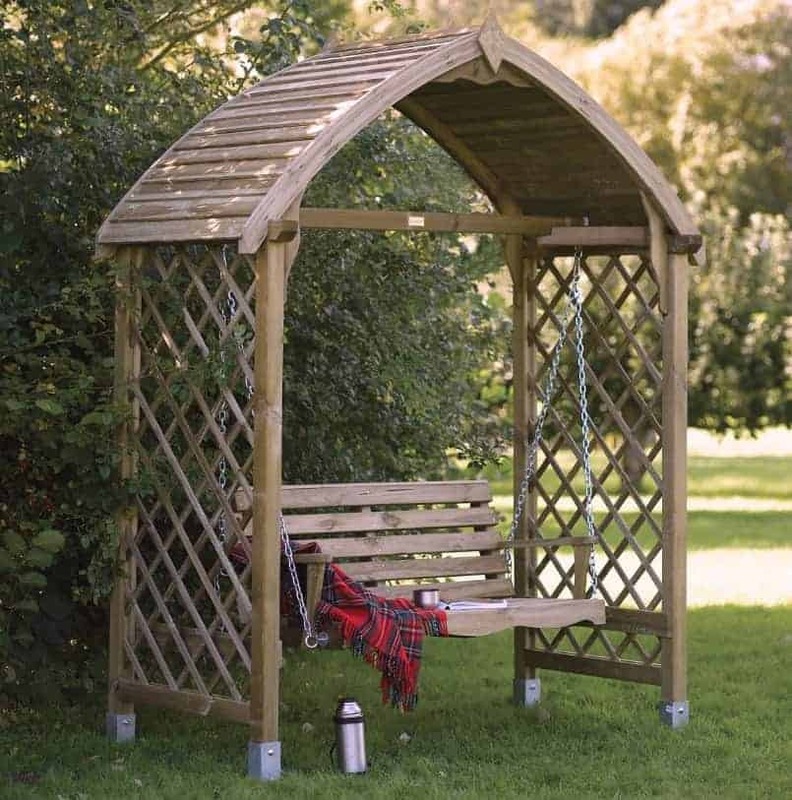 Having an arbour in your garden is a great way to give it a little bit more style and personality, but this one takes things to the next level by adding a swing seat into the mix. This gives you the ultimate place to relax on your own or spend time with your significant other. 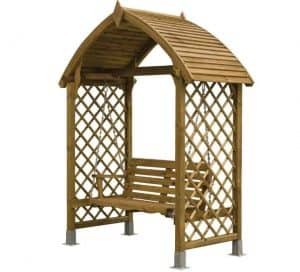 The arbour is very well made and is going to give you many years of use. Lots of clever design choices have been made to ensure that it not only looks gorgeous, but also so that it is strong and can stand up against anything the bad weather can throw its way. 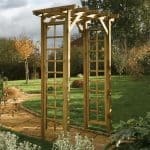 The Blooma Barmouth Timber Swing Arbour is the perfect accessory to really give your garden some serious style. This is just such a well made arbour that we are sure for many of you this is going to be love at first sight when you see this. We feel that this is the kind of feature which would finish a garden off just nicely and also provide you with a lovely place to sit and relax with a glass of wine after a hard day’s work or even a place to sit and read a story with the kids. This is a far larger structure than the pictures let on as the width is over 6 feet and the depth 3 feet 4 inches. But as this has a swing you will want to make sure there is at least 1 foot 9 inches of free space in front and behind the arbour, as that is how far the swing will go back and forth. So as relaxing as this, we are sorry to tell you that you will not be able to give your friend an over under once you have had a few glasses of wine. 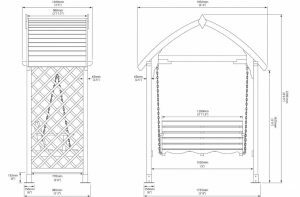 The arbour stands close to 8 feet high which makes it a very picturesque kind of structure so it is certainly something that will catch people’s eyes as it stands in your garden. The top of the arbour is done is this very attractive arch. We really like how they have used some very eye catching cladding here so it will keep you a little bit shaded from the sun. On the front there is this very nice decoration that we feel finishes off the top of the arbour very well. The sides of the arbour are very classy looking. 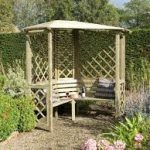 We love the lattice side design as even if you just leave it as it is, it looks fantastic, but during the summer months we feel that some hanging flowers draped over here would look amazing. The whole arbour is actually far more secure than you would think and this is because Blooma have used a very strong frame to make this one very robust arbour. As you can see from the pictures it is a very thick frame so it will make this one very sturdy arbour that is not going to become weak and flimsy after a couple of years. Ah the seat, the seat is perhaps the most important part of this arbour as it is where you are going to be spending most of your time, preferably with some kind of alcoholic beverage in your hand. The seat is a very good size and we feel that you could have two adults sitting comfortably on here, maybe three as long as one of you is willing to breath in and be stuck in the middle. The actual seat is made with some very thick planks of softwood and is secured to the frame with galvanised steel chains. 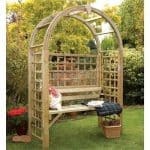 This is one lovely looking arbour and if you want to keep it looking great and make sure you get many, many years out of this then you will want to give the whole arbour a generous coating of wood treatment. This to be honest with you is not a whole lot of effort and will take far less time than you think and the end result will be an arbour that stays rot free. It will stay rot free as long as you remember to give it a coating of treatment once a year. 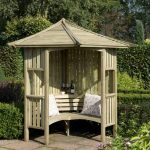 This arbour comes with a very generous 10 year anti rot guarantee, but as is the case with most Blooma products, you will have to treat the wood in order for the guarantee to actually be valid. 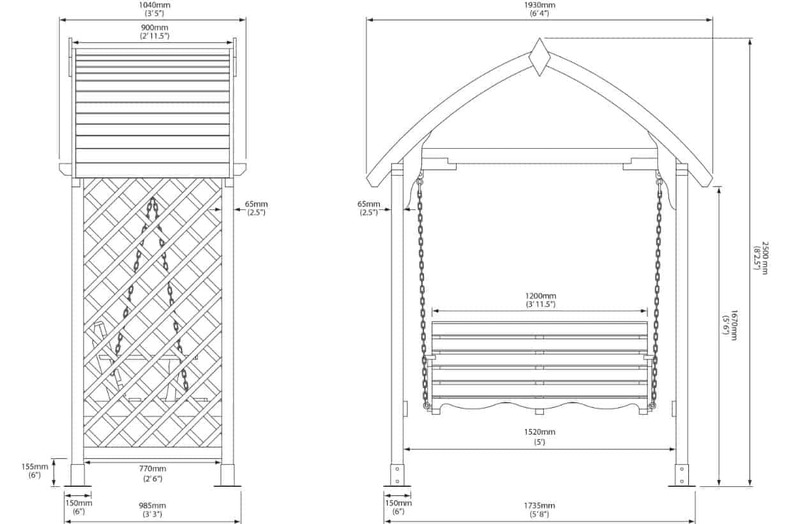 So we know the actual seat of the Barmouth Timber Swing Arbour is well made, but what about the seating area in general? Well we feel that Blooma have actually made a very smart design choice with this arbour in that the seat is not so close to the sides that you will be constantly smashing your elbow of it when you use the armrest. In general the seating area of this arbour is quite spacious, but like we said before make sure you have enough room in front and behind of it. The manufacturer actually recommends that you secure this to the ground so either dig those legs in if you are installing this on grass or secure it to the floor if it is going on decking or concrete. In general this is one very solid arbour and if you do take the proper precautions by securing it to the ground, you will be amazed at just how secure it feels. If you have green fingers then you will be able to have a lot of fun arranging flowers on those lattice sides. Or you could always give the arbour a dash of colour by painting it. No extras are offered by Blooma for this arbour as you get everything that you need included with it. This just means that you have more money in your pocket for snacks and drinks to enjoy while you are relaxing on here. This is very well made and the overall design of it is something we really like. In general we are very pleased with the high quality of this arbour. This is very well made and is going to provide you with a place to relax for many years. The wood will need to be treated once a year in order to keep rot away, but we do not see this as a huge problem. 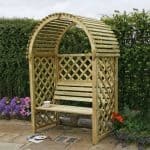 The pictures really do not do this arbour justice it is just such an impressive looking structure and it will take up quite a bit of space in your garden. Make sure you take into account the space the swing needs to swing back and forward when you are measuring your garden for this. Anything that is this high is going to be a bit of a challenge so make sure you have a friend to help you out. This is more fiddly than it is difficult so stick with it and you should be done in around 6-8 hours. This is one of the more expensive arbours that we have seen, but it really does have a fantastic look and it is going to give you many years of use. Final Thoughts: The Blooma Barmouth Timber Swing Arbour is a very impressive looking arbour that is also a lot of fun thanks to the swing seat that it has. We really like this and feel that it is one of the more extravagant arbours from Blooma. We love how large the seat is and those lattice sides will look amazing on their own and just incredible with flowers hanging from them. This is one of the more pricy arbours on the market, but we do feel that its style and the materials used in its construction make it worth the money. If you are looking for a place to relax in your garden and also have something that will be a stand out feature then we highly recommend you have a serious think about this arbour.